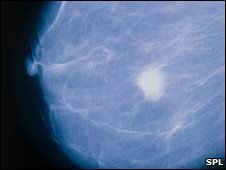 BBC NEWS | UK | Magazine | Are there dangers in breast cancer screening? Are there dangers in breast cancer screening? Women going for routine breast cancer screening are being misled about the risks of being misdiagnosed, a recent report suggested. But it's vital to get the numbers in context, says Michael Blastland in his regular column. Go for a scan and you might end up with surgery you don't need. It's been argued, with some merit, that NHS information leaflets state the benefits, but ignore the biggest risks. The latest news shifts the emphasis to what might go wrong. But that can also go too far. We need both sides of the story - how big are the risks compared with the benefits? There are two steps to seeing them in proportion. The first is that a test can be wrong. There's evidence that many doctors don't understand the simple maths of this. Say that routine screening is 90% accurate. Say you have a positive test. What's the chance that your positive test is accurate and you really have cancer? The surprise is that it's impossible to answer that question correctly with the information given. But many doctors think otherwise. They think a positive test that's 90% accurate means it's 90% likely to mean cancer. Not so. It sounds puzzling, but a picture makes it clear. First, let's stop talking percentages, and talk about a real number of women. And let's give more information - that if you take 1,000 women randomly, of mixed ages, very roughly 10 will have breast cancer. These numbers are not intended to be precise, but are not far off. We've rounded everything to make it easier. Now for the chart. Suddenly, we see how most of the positives from routine screening are false alarms, occurring among women who don't have cancer. Of all the women who have positive tests, only about one in ten will truly have cancer, but they won't yet know which. That's how a test with 90% accuracy can result in only about 10% certainty, and why thinking about it in percentages can leave some people muddled. Our advice is - don't. Think in people instead. So one risk of screening is anxiety - thinking a positive test means you're almost sure to have it, when in fact you're not - an anxiety that could be lessened if people knew these facts. That they often aren't told this is odd, to say the least. But don't stop there. Because screening has narrowed the doubt. If you have a positive test, you now have a one in ten chance of cancer instead of one in 100. And if you have a negative test, the chance is now even lower than before. The next step is similar but more serious. Almost all false positives are cleared up - though sometimes it takes a biopsy to find out - but not all, and some lead to unnecessary treatment. A small number of cases show an unusual cellular state that might develop into full-blown cancer, but some won't - and again we don't know which. Those that were destined to be harmless but are removed anyway are another kind of false alarm. And there's a third kind. Some people, even though they really do have cancer, would die of something else before the cancer finally struck. Again, we seldom know which. Put the doubts together and, according to the critics, the picture is now roughly this for a group of 2,000 women. We start with 2,000 women this time in order to show up the one case of unambiguous benefit. We've also shown all the uncertain cell states as among the false positives. But all this might be too pessimistic. For example, screening's critics judge it on the number of people invited to attend, not on the number who do. So some deaths - among people who don't attend - are set against screening's success rate when arguably they ought not to be. According to the NHS, the true picture is better. And there are two other important caveats. First, judging screening by one measure, survival or death, is crude. There are other benefits of being diagnosed early that don't show up in this analysis. Second, the older you are, the greater the likely benefit of screening. On these figures, given the number of women who go for screening, the NHS says about 1,400 lives are saved each year. One statistical campaigner, Professor Gerd Gigerenzer of the Max Planck Institute, has been arguing for the information to be shown this way for years. It's not obvious why it isn't. What the technique mostly helps us see is the element of uncertainty. But perhaps that is part of the explanation. Many of us hate uncertainty. Doubt mixed with fear is a horrible combination, "give me a test and tell me the correct answer", a justifiable hope. But it is also often an impossible expectation. We can narrow the doubts, sometimes by a large margin, but we can't eliminate them. Should the NHS strive to explain that, or to offer the reassurance most people crave? And what if doctors offer advice having misunderstood the degree of uncertainty? The decisions are painful enough, all the more reason to be as clear as we can about the balance of risks and benefits. • Someone has to say it, but it doesn't half get boring trying to change this habit. Reports this week of the effect of drinking on breast cancer - and other cancers - failed miserably - again - to say how many people are affected. They all simply give percentage increases. A drink every day increases your chance of breast cancer by 12%. But here's a simple fact that everyone knows - except journalists, apparently. When playing Who Wants to Be A Millionaire, a 100% increase in your money can be worth next to nothing, or a fortune, depending where you start. A 12% increase can similarly mean a lot, or a little. Did the news reports tell us where any of the cancers starts? Of course not. Nothing so helpful. The answer, as we learnt above, is that a bit less than 10 women in 100 have breast cancer in a lifetime. So a 12% increase if they all consume one extra drink ever day, takes us to… 11 women in 100. The 12% works out at one person in every 100. Perhaps one in 100 sounds less scary than 12%, and that's why it isn't reported this way. But why not report both? What's the problem, shortage of space on the internet? Although I don't know of the details of these reports, it seems to me that part of the reason that this use of percentages is confusing is that it is just wrong! From what I can see from this article, it is the number of cases of cancer that is increased by 12%, not the risk. So it is just wrong to say "your chance is increased by 12%", and it should say "your chance is increased by 1%". I do however agree that better information of the form suggested in the main part of the article would indeed by most helpful. I fully agree with the sentiment of the article. Statistics are fine but their presentation can be manipulated in many ways and that obviously affects how they are perceived. I listened to the news this morning about how women can increase their risk of breast cancer by drinking alcohol (even within the government guidelines). As a person who enjoys a glass of wine and also has known several women who have gone through the experience of having or still have breast cancer this caused some concern. I then thought about how the data was presented and decided that the actual study and results were more complex than the knee jerk reaction of 'oh no I better stop drinking that glass of wine it might give me breast cancer' which is the reaction elicited by the news report. Statistics are fine but should be considered carefully and looked at as suggested by this article in other ways in order to get a balanced picture. An excellent article. Thank you for treating me as an intelligent woman. This to me seems absolutely crazy. I am only a 3rd year (of 4) medical student but in my opinion it seems so many things have failed to be taken into account. Like, for example, the possibility that doctors actually have a higher suspicion of cancerous growths in older women, and lower in those younger, shifting the bias of those with suspicious breast lesions to only those appropriate requiring biopsies. I also find the comments about the unusual cellular state (I assume you are referring to dysplastic-type conditions such as ductal carcinoma in situ) rather bizarre, as you clearly state that we don't know which will progress to cancer. Having seen these types of diagnoses done, the patients are generally given a choice of whether to have watchful waiting or have it removed, but warned that there is a possibility of progression if it is not removed. As such, surely given that we are unable to tell which will progress, it is a positive thing to heavily diagnose these kinds of conditions. These are just a few quick thoughts, and I apologise for any errors in my science/statistical interpretation of the article, but I found it to be flawed in my opinion, with massive errors in interpretation of the statistics. I would rather have surgery I didn't need than run the risk of having a cancer that was not treated in time. Also one person in a hundred is still a high number especially if that one person turns out to be you. What a good article! Further proof that statistical reporting can easily lead to unnecessary fear amongst the populace. Many scientists like to use statistical reporting because it makes things look more significant than they really are - the having a drink a day example shows this very well: "Possibly 1 extra woman per 100 may risk increasing her chances of breast cancer" doesn't sound as scary as "12% higher risk for all women who have a glass of wine!". Further exploration of this subject matter can be seen in the popular science book "Chances Are: Adventures in Probability" by Michael and Ellen Kaplan. I would be surprised if the author had not read the book. Thanks for putting the appendix on your article about percentages and numbers. I read that alcohol article this morning and was thinking exactly the same thing. It's bad journalism trying to create a sensation and its just plain wrong. The article on breast cancer and alcohol also didn't mention whether women who drank moderately perhaps had other lifestyle factors that lead to a slightly higher risk of cancer. Correlation is not causation. Thank you for this series of articles. They explain it all _so_ clearly. I'm a statistician working with almost all non-statisticians so I have to explain concepts like this myself. It's also nice to see statistics quoted misleadingly highlighted too. Thank you - such a clear explanation of the news....and cheers! But of course, even if statistics show that one drink a day means 12% greater chance of cancer, it is not evidence that stopping drinking one drink a day will have any effect at all. It could equally be that whatever causes the drinking also causes the increased risk. I recently had a positive test from a mamogram and was called back within two weeks to have another mamogram, an ultrasound, physical examination and biopsy - all at the same time. One week later I was told that the lump was benign, although the radiographer told me that she thought this would be the case. Yes I had an anxious week - but much rather this have happened than not. At least I know the full situation now - and I know exactly where the lump is if I happen to find it myself. Who is complaining about the anxiety - surely not the women who later find that they are clear - relief is so wonderful and I was very grateful for all the treatment and care I was given at the Walsgrave Hospital in Coventry.